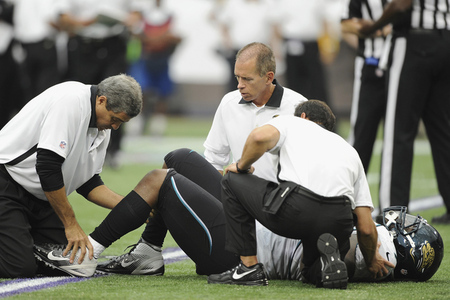 First Coast Foot and Ankle Clinic could not be more excited that football season has begun! But already three of the Jacksonville Jaguars offensive line starters are wearing protective boots on their left ankles following the overtime loss to the Minnesota Vikings on Sunday. In this one game, there have been more injuries to the lower extremities than any other and Coach Mike Mularkey is starting to wonder if it might have been a turf issue. “It’s the most foot injuries I’ve ever been around,” Mularkey said. “Foot, ankle, you think about the number of linemen we have lost with it, it’s just unheard of. I don’t know if it’s bad luck. I am putting a little research out there with some of the turf teams if they’re experiencing the same kind of issues we are with our ankles and feet. We have had an unbelievable number of injuries to that part of the body. More than I’ve ever been around.” So what will happen this Sunday when the Jags hit Everbank Field to take on the Houston Texans? Even with a ranking of 32nd in the NFL in total offense and all these injuries the offensive line is still showing signs of improvement.